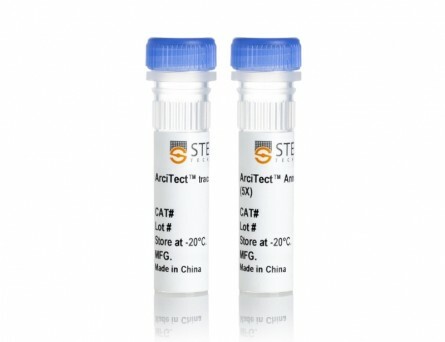 ArciTect™ Cas9-eGFP Nuclease is a fusion protein consisting of enhanced green fluorescent protein (eGFP) and the wild-type Cas9 recombinant protein from Streptococcus pyogenes. 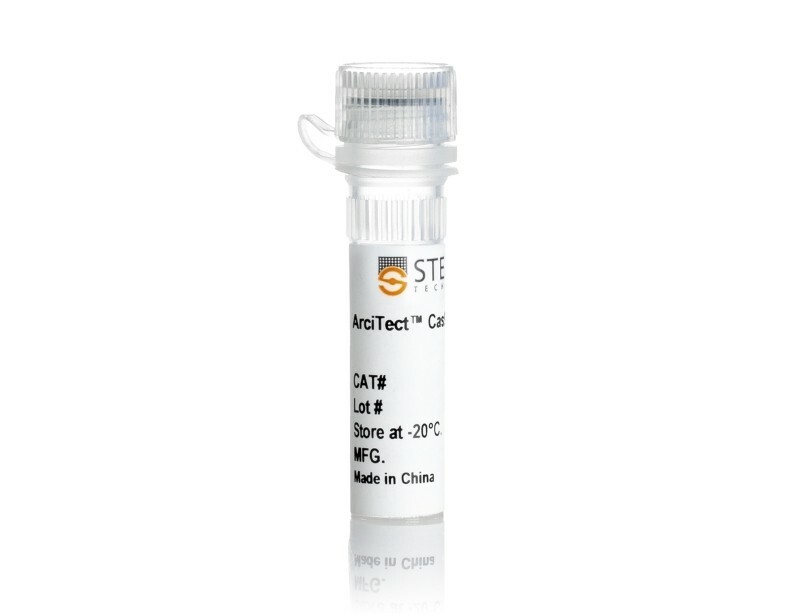 ArciTect™ Cas9-eGFP Nuclease contains a C-terminal-linked eGFP molecule that can be used for fluorescence-activated cell sorting of positive transfectants, transfection optimization, or other experiments requiring the visualization of Cas9. ArciTect™ Cas9-eGFP Nuclease requires association with a guide RNA, composed of ArciTect™ tracrRNA (Catalog #76016) and ArciTect™ crRNA (Catalog #76010), to form a ribonucleoprotein (RNP) complex. 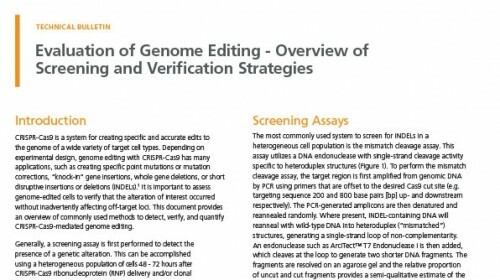 This RNP complex creates double-strand breaks at site-specific locations in the genome. 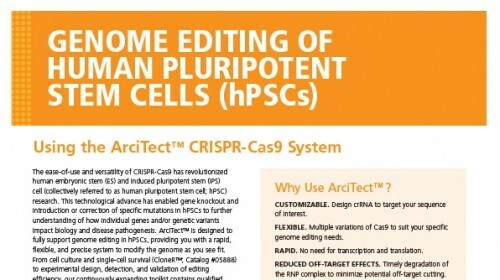 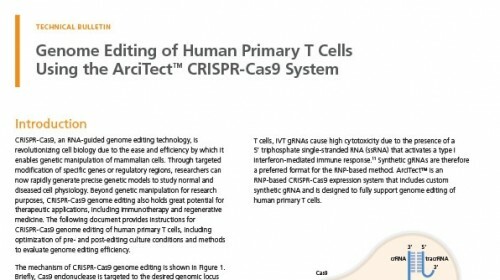 ArciTect™ Cas9-eGFP Nuclease also contains a nuclear localization signal at the N-terminus, ensuring that the RNP complex translocates to the nucleus, thereby increasing the efficiency of genome editing. 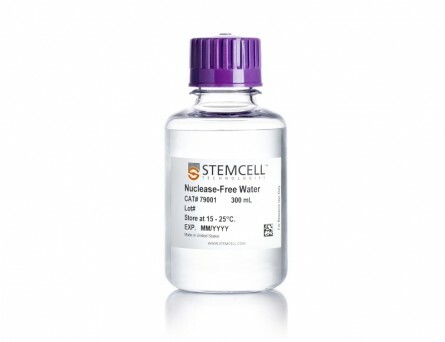 As the RNP complex is fully functional upon transfection, it allows for immediate activity following translocation to the nucleus. 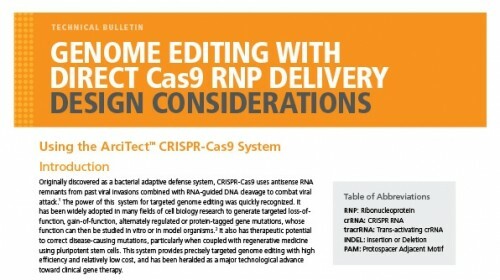 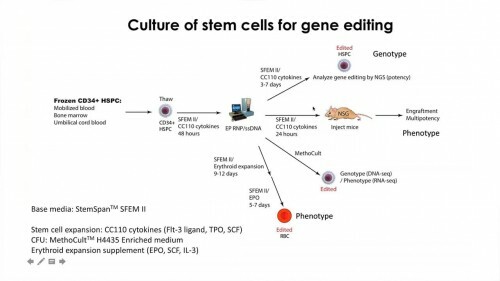 The RNP complex is degraded over 48 hours, allowing sufficient time for genome editing to occur while reducing off-target effects that can be caused by the continuous presence of the RNP complex. 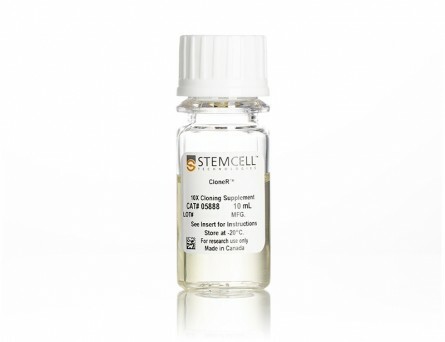 Using the RNP system also circumvents the laborious process of generating stable Cas9-expressing cell lines, saving time and reducing the risk of off-target effects due to leaky inducible expression systems. 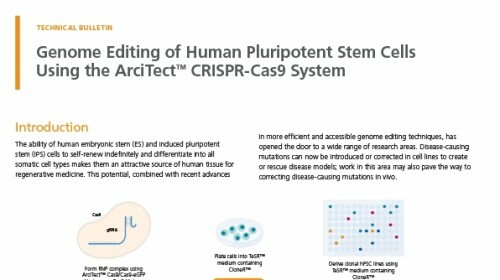 The S. pyogenes Cas9 uses the protospacer adjacent motif (PAM) sequence NGG (where N can be any nucleotide). 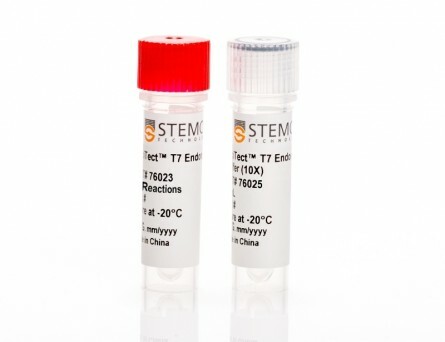 The enzyme will not cleave without a genomic PAM site downstream of the target sequence. 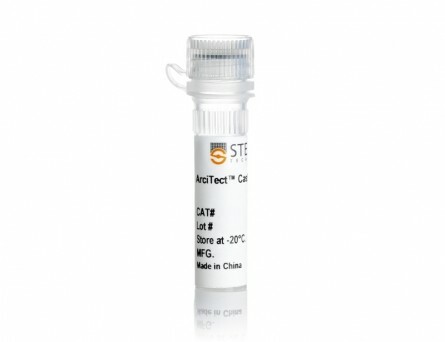 The purchase of the ArciTect™ products conveys to the purchaser the limited, non-transferable right to use, in accordance with all applicable laws and regulations, the ArciTect™ products and any related material solely for research purposes only, not for any clinical, human, agricultural, veterinary, livestock, or commercial purpose, with no warranty (express or implied) from the owners or assignees of the Patents or STEMCELL Technologies each of whom expressly disclaim any warranty regarding results obtained through the use of the ArciTect™ products, and without any exception the owners or assignees of the Patents or STEMCELL Technologies, or as applicable a director, trustee, officer, employee, agent, faculty, official investigator or student thereof, will not suffer or be exposed to any liability, damages, loss, or expense of any kind whatsoever arising from or related to the use of the ArciTect™ products by a purchaser of same. 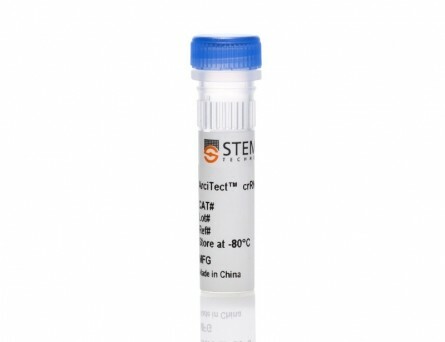 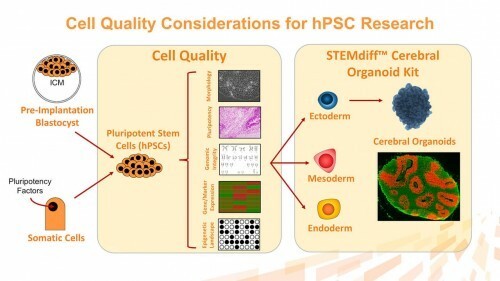 Distribution of ArciTect™ products by STEMCELL Technologies is covered under at least US 8,697,359, US 8,771,945, US 8,795,965, US 8,865,406, US 8,871,445, US 8,889,356, US 8,889,418, US 8,895,308, US 8,906,616 and foreign equivalents (“Patents”).